It's not too late to see the freak Comet Holmes. Although if you wait too much longer, it may be. It has gotten so big and diffuse that, as bright as it is, it can be hard to see without binoculars -- especially when the moon is up (which will be less of a problem over the next few days). But it is still visible from my only-moderately dark location. And with binoculars, it is incredibly obvious. For more info on this old comet that suddenly and unexpectedly "exploded" and became immensely brighter than usual, see this Sky and Telescope article from November 15. Up in the sky -- a bright and unusual comet! At a family reunion Saturday night outside of Bastrop, I took a break from the festivities to step outside and spend some time with our dog, Ginger, who unfortunately was not invited inside. It was a clear night, and where we were, the skies were relatively free of light pollution, so my eyes naturally went up to the sky. The most open view was towards the north, so I found myself staring at the familiar stars of the constellation Perseus. I've been intimately familiar with the star patterns of the night sky since I was a little kid, so I quickly recognized what I was looking at. For us northern hemisphere residents, Perseus is a dramatic constellation, in the plane of the Milky Way galaxy, and thus populated with numerous relatively bright stars. Something was bit amiss, that night, however. Just outside of the familiar pattern was a bright fuzzy "star" that was not familiar to me. It was just about as bright as the stars in the main constellation, so I was puzzled why I had not noticed it before. I've not paid nearly as much attention to the night sky and other astronomical phenomena in recent years -- perhaps my memory was playing tricks on me? Its distinct fuzziness also made me think my contacts were not focusing properly. But other stars seemed fairly crisp, so that couldn't be the issue. Could this be one of Perseus' bright clusters, thus explaining its fuzziness? If so, it was brighter than others that I remembered well, and I would be extremely embarrassed to forget about so bright a cluster. I'm not that old yet. I stared at the fuzzy unfamiliar "star" for several minutes, pluging the depths of my memory, but just could not dig up anything. I then decided to retrieve my binoculars from the car. That would settle once and for all the question of the stars' blurred appearance. Sure enough, in the binoculars, the fuzzy star appeared even fuzzier, even as the uncountable number of other stars appeared as sharp as ever. Something was up. I knew there was no cluster in this spot, certainly not one anywhere near this bright. That would be one of the brightest clusters in the sky and would be impossible to forget. By process of elimination, I determined that this had to be some sort of comet. There was no hint of a tail, but that wasn't that unusual, in my experience -- comet tails can be much fainter than the head. Quite an exciting find, given that I had no prior clue of its presence, thanks to my lack of attention to events in our neighborhood of the Solar System. The comet that suddenly became about a million times brighter nearly two weeks ago continues to "shine" with abnormal luminosity, leaving observers puzzled over what caused the outburst and whether the comet will perform an encore in the coming months. Comet 17P/Holmes is normally an invisible runt of a comet, about 3.3 kilometres across and about 25,000 times too faint to be seen with the naked eye. But following its sudden brightening on 23 October, the comet's coma, a surrounding shell of gas and dust, has been expanding at a rate of about 0.5 kilometres per second, making the comet appear as a fuzzy "star" that can be seen with the naked eye in the constellation Perseus (see image at right and watch a video of dust streaming off the comet's icy body, or nucleus). The comet was actually discovered during a similar, but less spectacular, brightening event in November 1892. It faded after a few weeks, only to dramatically brighten again in January 1893. The comet orbits the Sun every seven years on a path that takes it from the distance of Jupiter's orbit to about twice that of Earth's. Interestingly, in both the 1892 event and the recent one, the comet initially brightened about five months after reaching perihelion – its closest approach to the Sun. "It's curious that the outburst came in the same period of orbit," says Brian Marsden, former director of the Minor Planet Center at the Harvard-Smithsonian Center for Astrophysics in Massachusetts, US. "It will be interesting to see if it behaves in the same general way [this time as before]." The common timing of the two mega-outbursts following perihelion suggests that the intensity of the Sun's radiation is a key factor in the brightening. But that alone is not enough, as the comet reaches perihelion every seven years and hasn't produced such an outburst in 115 years. There are also plenty of comets that make closer approaches to the Sun than Comet 17P/Holmes without brightening nearly as much. So go out on a clear night soon, look to the northeast and you, too, can see the new, and very unusual, comet. It's the brightest one we've had since Hale-Bopp back in 1997, but very different. UPDATE: Predictably, Sky and Telescope has an excellent account of this comet and how to see it. If you're not wrong at least half the time, you're not working hard enough. The L.A. Times obituary, of course, celebrates some things Paczynski got right. Astrophysicist Bohdan Paczynski, who was the first to suggest that gamma-ray bursters lie outside the Milky Way and who revolutionized astronomy by using gravitational lensing as a tool to search for dark matter and new planets, died April 19 in his Princeton, N.J., home after a three-year battle with brain cancer. He was 67. His novel ideas were often at odds with the conventional wisdom of his peers, but more often than not, he was proved correct, and his insights opened many new areas of research, including the search for stars and other celestial objects whose light output varies over time. "He was incredibly creative and original," Princeton astrophysicist Michael Strauss said. "All of his life, he brought interesting approaches to interesting problems." Astrophysicist Adam Riess of Johns Hopkins University said, "People often said that if you had a clever idea and were thinking of writing a paper, you had better check with him first. "When I was in graduate school, I thought it would be neat to look for supernovas in [gravitationally] lensed systems. I looked it up, and he had already described it." A native of Poland, Paczynski settled in this country permanently in 1981 when Polish leader Gen. Wojciech Jaruzelski cracked down on the Solidarity trade union movement while Paczynski and his family were in this country on sabbatical. But he retained close ties with the Polish astronomical community, collaborating with researchers there and creating a pipeline to bring many to the United States for training and research. "He is basically a legend in Poland," said astronomer Krzysztof Pojmanski of the Harvard-Smithsonian Center for Astrophysics. I'm not sure Pacyznski would be happy with the phrase "more often than not, he was proved correct." By the standard of his earlier words, that would mean he wasn't working hard enough. And I find that very hard to believe. Yet another alleged "Earth-like" planet is currently in the process of being over-hyped. Having made three posts on similar misleading announcemens in the press over the last couple years, I was originally not inclined to post on the same subject yet again, even if it has been a year since the last one. Alas, I'm getting a significant amount of traffic (by this site's standards, it's a flood) from web searches for "new earth like planet" and variants, so I feel I should say something. In short, read my previous three posts on similar announcements: from June 14, 2005; from January 26, 2006; and from March 14, 2006. This one appears to be much the same--misleading. Some astronomers, unfortunately, can be eager to join in on the hype, as "Bad Astronomer" Phil Plait does at his blog today, with a post titled, "HUGE NEWS: first possibly Earthlike extrasolar planet found!" Eugene Chiang, a planetary specialist at UC Berkeley, said the Europeans had no proof the planet was rocky, or that their estimates of the surface temperature were accurate. "This is a step beyond what's been done," he said. "But to say this planet is habitable is a real stretch." If alien astronomers saw Venus from afar, for instance, they would not be able to tell that a runaway greenhouse effect had created an unlivable hell of a world, with temperatures of 750 degrees Fahrenheit. "The surface temperature depends on the atmosphere, and they don't know what the atmosphere is made of," Chiang said of the new planet. All the evidence for this planet being anything remotely like our own planet is based on speculation on top of speculation. And while, as Plait says, speculation can be fun, it is definitely not "HUGE NEWS." Once again, I have to lament that, when the time comes that we actually do discover solid evidence for a planet that strongly resembles Earth, the general public will have become so jaded to these periodic announcements that it is likely that they will no longer care. Icy super-Earth or Gassy sub-Neptune? I'm starting to feel like a broken record on this. Headlines are once more trumpeting the discovery of an extra-solar planetone of well over a hundred that have been revealed within the last decade. This one is apparently not "Earth-like," as a couple others were erroneously described, but rather a "Super-Earth." Astronomers on Monday announced the discovery of a frigid extrasolar planet several times larger than Earth, orbiting a small red dwarf star roughly 9,000 light-years away. The finding alters astronomers' perceptions of solar system formation and the distribution of planets in the galaxy, suggesting that large rock-ice worlds might outnumber gas giants like Jupiter. The newfound planet is about 13 times heavier than Earth and likely has an icy and rocky but barren terrestrial surface, and is one of the coldest planets ever discovered outside of our solar system. As we have repeatedly seen, though, we can't believe everything we read in the press. So it pays to go to the original material. Like the planet discovery I wrote about earlier this year, this one was produced by a group of astronomers that have built a systemcalled OGLE, for Optical Gravitational Lensing Experimentthat monitors millions of distant stars in small regions of the sky, searching for a few cases where intervening objects pass in front. When that happens, the light of the more distant object is bent (thanks to Einstein's general relativity) and focused to cause a temporary brighteninga process known as gravitational lensing. As the invisible foreground object passes by, the background object eventually returns to its original brightness. The pattern of brightening and dimming over time is called the "light curve." All we know about the planet is based on the shape of the light curveactually, on the difference between the shape of the light curve and the best-fit model of a single star acting as the lens. In this case, that difference is a few percent at most and lasted a mere couple hours. The observational achievement is impressive and the result of years of effort in constructing the OGLE system. Astronomers are masters at extracting the maximum amount of information from a minimum of data, and this case is a good example. From the light curve of the entire lensing event, the astronomers make estimates of the mass of the star, the mass of the planet, the separation of the two, and their distance from us. Unfortunately, the process of extracting the information is full of large uncertainties, so the final results are also highly uncertain. The ratio of the mass of the planet to that of its parent star is uncertain by a factor of two, bringing the total uncertainty in the planet's mass to a factor of sevenfrom a bit over three times Earth's mass to over twenty times. Uranus and Neptune are the only planets in our Solar System that fit within that mass range (15 and 17 Earth masses, respectively). Inevitably, but unfortunately, all this uncertainty gets wiped away during the transition from scientific paper to journalistic article. Also inevitably, terms that astronomers use to hype their own results are adopted and used uncritically by reporters. The lead author of the team that produced this result, Andrew Gould of Ohio State University, repeatedly labels his new find an "icy super-Earth" when quoted by reporters. But in the scientific paper submitted to Astrophysical Journal Letters, that phrase is never usedand "super-Earth" is only used once, in this sentence: "[These two new planets discovered with gravitational lensing] must have a large fraction of rock and ice, but whether these are covered with a thick coat of gas, like Uranus and Neptune, or whether they are “naked” super-Earths such as are theorized to have formed the cores of Jupiter and Saturn, is unclear." Gould is clearly using the "icy super-Earth" phrase in his public statements to get press attention. An equally (perhaps more) accurate alternative"Gassy Neptune-like world"would not attract nearly the same attention. Well over a hundred extrasolar planets have been discovered in the last decadewhat's one more without a catchy slogan? As in this case, good, interesting scientific results can get buried under a mass of speculation and over-enthusiastic extrapolation when communicated to the general public. Scientists do this amongst themselves for fun, to help direct their research in productive directions, and of course to promote their own line of inquiry to their funders. But I suspect this just leads to confusion amongst reporters and readers, and diminishes the public impact and understanding of later, more refined and more accurate, results when they come in. If NASA's recent decision holds to indefinitely delay the Terrestrial Planet Finder missiondesigned to allow us, for the first time in human history, to detect planets roughly the size of Earth at roughly the distance from their parent stars to be conducive to lifeperhaps it is because, thanks to all the recent hype, the public already thinks we have the capability to find "Earth-like" planets? Once again, headlines are proclaiming the discovery of an "Earth-like" planet orbiting another star. Once again, closer inspection of the reports indicates that this new-found planet, based on the very little we know about it, is very unlike Earth. Didn't this just happen a few months ago? This is a shame, since behind the misleading headlines is an interesting discovery. This planet was found via a system of telescopes and instruments, set up over the last fifteen years or so, that monitor millions of stars regularly, looking for variations in their brightness. The particular system used here is called OGLE, for Optical Gravitational Lensing Experiment. As predicted by Einstein's General Theory of Relativity, massive objects can act as lenses, bending and focusing light that passes near them. As a result of this gravitational lensing, if a too-dim-to-see object passes in front of a brighter, more distant star, the light of the background star brightens gradually before dimming back to normal, revealing the existence of the otherwise unseen foreground object. The amount of brightening and how quickly it happens (typically weeks to months) depend on the mass of the foreground object and how close it comes to directly passing in front of the background star. As a result, astronomers can use their measurements to estimate the mass of the unseen objecttypically a star. Stars are small (relatively!) and the galaxy is very large, so these lensing events are not common, necessitating monitoring huge numbers of stars to catch a decent sample of events. From the analysis presented by the team of astronomers, the distance to this stellar system is known to within 30% or so. It is close to the center of our galaxy, twenty-thousand light-years away. This is much, much futher away than the vast majority of other extra-solar planets discovered in the last ten years by other techniques. Those are around stars in our own local neighborhood of the galaxy, within a few tens of light-years. If we compare the distance of the typical known extra-solar planet, on the order of 100 light-years, to the distance between downtown San Antonio and Kerrville (60 miles), then the distance of this newly-discovered planet is half-way around the world. That's a long way off! The only reason we can know anything about this planet is due to that freak lensing event as it passed virtually directly between us and a background star. Since that is not going to happen again for this object, we won't be able to learn anything more about it. At least not until we invent radically new astronomical instruments and techniques well beyond the capabilities of anything currently imagined. The information the astronomers can get from this one-time event is extremely limited. The mass of the planet is only known to within a factor of fourit could be anywhere from 2.5 to 10 times the mass of Earth (and that is just the one-sigma confidence interval, for those familiar with such terms). If it's on the bottom end of that range, its mass, if nothing else, could be described as "Earth-like." But the star it circles is much smaller than our Sun, as revealed by its lensing effect on the background star. And, based on the delay between the peak of the central star's lensing event and the planet's lensing event, it is much further out from its sun than we are from ours. If we know anything about this planet, it is that it must be extremely cold. That should conclusively rule-out any notion that it is like Earth. And just as easily as the planet could be only a few times Earth's mass, it may be 10 times Earth's mass. That and its frozen temperature would make it much more Uranus-like than Earth-like. Unfortunately, we're not going to find out anything more. The benefit of studying lensing events is not learning about individual systems, but getting a relatively unbiased sample of what kinds of objects are out there floating around in the galaxy, occasionally passing in front of background stars. As yet, lensing events have revealed only three planets, including this new discovery, so any statistical information that can be derived is extremely limited. Of course, that's not stopping some people. Scientists love to speculate. 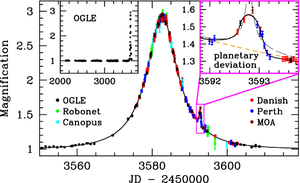 As Dr. Beaulieu explained in an e-mail message, it would have been much easier to see a giant gaseous type of planet. 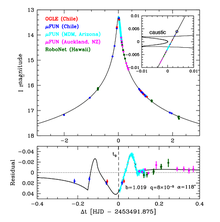 The long odds against detecting so small a planet as the new one argues for its commonness. "If only a small fraction of the stars had such planets, we would have never detected this small planet," Dr. Beaulieu said. Scott Tremaine, a theorist at Princeton, said, "The results suggest that rock-ice planets must be more common than gas giants." Eventually, thanks to the more traditional techniques used to find planets in our neighborhood of the galaxy, we'll find a true Earth-like planet. One close enough to study in much more depth. I look forward to those headlines, perhaps a decade or so away. For more, get the straight scoop from the scientists at OGLE and PLANET, or else read Phil Plait's Bad Astronomy Blog for a nice summary. Very soon, NASA will launch a mission to one of the last remaining unexplored regions of our Solar System. 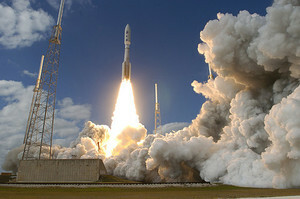 The New Horizons probe will be launched, hopefully next week, on a journey to the planet Pluto and beyond. No humans will be on board, of course, but that does not cut down on the excitement of the mission. It is not often that we get to explore new and unknown worlds. Several media stories claim that the pressing issue is whether Pluto deserves to be labelled a planet. But it is what it is, whatever we call it. The real issue is that we know virtually nothing about Pluto and its compatriots at the outskirts of our Solar System. It is a region called the Kuiper Belt, populated with thousands of objectsof which Pluto was the first discovered and still one of the largest known. What is known about Pluto thus far, said one NASA employee recently, “could basically fit on a postcard”. That Pluto had company in its distant environs was only discovered within the last fifteen years. But now that Earth-bound telescopes have revealed the existence of the mysterious Kuiper Belt objects, this region has become one of the most compelling destinations in the Solar System. "Thoughts of Pluto raise images of something very dark, far away and cold. But actually Pluto is a treasure-trove of scientific discovery just waiting to be uncovered," said Andrew Dantzler, director of NASA's solar system division. "A successful mission helps us meet one of our key objectives — understanding the formation and evolution of our solar system." Hence, New Horizons. Using a gravity assist from Jupiter, the probe will take nearly a decade to reach Pluto and its satellite (or "sister planet" as some call it) Charon. It will take a few more years to reach other Kuiper Belt worlds that mission planners hope to study. And if past robotic exploration missions, such as Voyager, are any guides, many of the scientific questions that it will raise are not even known right now. Lowell Observatory astronomer Marc Buie says, "We're going to see things we've never even dreamed of." At the time New Horizons reaches Pluto, if tens of billions of dollars are spent and all goes smoothly, a twenty-first century version of Neil Armstrong may be getting ready to put a footprint on the Moon again. But the real exploration will be going on far, far away: "The New Horizons mission to Pluto and the Kuiper Belt - the first NASA launch to a "new" planet since Voyager nearly 30 years ago - allows the U.S. to complete the reconnaissance of the solar system." By the way, to get to Pluto on that timescale, New Horizons will be launched on "the fastest space trip ever taken," leaving the Moon behind in roughly nine hours. Just before the New Year, lunar scientist Paul Spudis wrote an op-ed in the Washington Post enumerating the reasons why this country is aiming to return humans to the Moon in the next fifteen years. I already examined his reasons and found them wanting. Alas, Spudis' argument was typical of the rhetoric used by a small, but vocal, group of proponents of manned spaceflight and was, as far as I could tell, well-received by that community. But now, none other than the NASA Administrator himself is shooting down one of their highlighted excuses for setting up a hugely-expensive base on our sole satellite. The first of Spudis' three stated reasons for NASA's new lunar goal was "science." He claimed, "The moon is a stable platform to observe the universe," and suggested that using the Moon as an astronomical base was very desirable, for radio astronomy in particular. I want to be very clear: I will not with the scientific community do another space station, meaning I will not say, 'Hey, we're doing this for you, and here's all the great things that can occur.' I well recognize that no one would go to the Moon to site astronomical platforms. No one would do that. Indeed, astronomy at the Moon does not justify the trip. We can do anything we'd want a lot more efficiently from space or, in many cases, right here on Earth. The headlines are proclaiming: Earth-like planet discovered orbiting nearby star, Distant Object May Be a Planet Similar to Ours, 'Rocky' Earth-Like Planet Discovered, Earth-like planet without life discovered outside solar system, Found: Earth's Distant Cousin. This new planet is roughly seven and a half times more massive than Earth, which makes it more comparable to the small gas giants Uranus and Neptune, at roughly half of their mass. Also, it orbits a tiny red dwarf star, much dimmer than our own Sun. Finally, it is extremely close to that small star, so that it is still searing hot. At such a close distance, the planet could be tidally locked, keeping the same face toward its star at all times. Dr. Marcy said the temperature on the side of the planet facing the star would be 400 to 700 degrees, like "chicken roasting temperatures." That is too warm for liquid water or ice, but it could be cold on the backside of planet, which, as Dr. Marcy said, "faces the darkness of the universe." We wouldn't be particularly comfortable if Earth were anything like that. If the speculation that it is rocky, and not a gas giant, is correct, it would be a bit more accurate to label it a Mercury-like, or perhaps Venus-like, planet. But, as with many of the extrasolar planets discovered to this point, our solar system has no comparable objects. The current means of detecting planets is geared, of necessity, to finding either very massive ones, like Jupiter and Saturn, or ones extraordinarily close to their parent star. Our system has no planets of the latter type, so one of the big surprises of this research since the mid-1990s is the large number of such planets being found. Of course, this particular discovery is still fascinating. Its discoverers have every right to brag, since they are pushing current technology to its limits in detecting planets so small. But someday, perhaps within another decade, with new space-based instruments, we actually will discover Earth-like planets. So let's not get ahead of ourselves.